one article of clothing at a time. 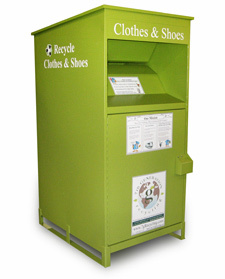 support Clothes and Shoes recycling efforts. Some of the Clothing & Shoes is distributed to benefit someone in your Community. The remainder is shipped to other parts of the World to those in need. By Recycling - We reduce the waste in our Landfills, We reduce wasted resources for producing new clothes, We reduce Emissions of Greenhouse Gasses. We reward your Organizations for the Clothing, Shoes and Household Textiles you collect. Your Organization can earn Money to help fund your Favorite Programs or Donate to your Favorite Cause. Any used clothing item and household textile such as pants, dresses, hats, shirts, drapes, curtains, blankets, towels, sheets, handbags, belts, and paired shoes. Stuffed Animals also acceptable. recycled items on a regular schedule. © Copyright 2008 7th Generation Recycling. All Rights Reserved.